Star Cinema and Viva Films recently released the official trailer of romantic drama movie "Ex with Benefits", featuring "It's Showtime" main host Coleen Garcia and Derek Ramsay. The story revolves around a 28 year old MedRep, Akisha Aragon portrayed by Garcia and her ex-boyfriend, Dr. Adam Castrances ( Drerek Ramsay). After 10 years, Adam’s ‘the one who got away’ came back to his life asking for his endorsement. For Akisha, to be the best MedRep, her products has to endorsed by the best doctor, even if she has to get too close again with her ex. Dr. Adam Castrances was supposed to be played by Sam Milby. However, Milby is studying in United States, aiming to improve his acting skills. His studies got in conflict with the creation of the movie as he is taking acting lessons in Ivana Chubbuck Studio at Los Angeles, California. The project has to continue, leading the production to choose Derek Ramsay to replace Milby. The movie not only raised various reactions from netizenz, but also raised some eyebrows of Medreps. Some medical representatives did not seem to like how their profession has been portrayed in the movie. Akisha is a very ambitious medrep who is willing to do anything to be the best, even if she has to sleep with her ex who never got over her. A certain Medrep, Nikki Quisimbing cried foul and asked the MTRCB to review the film. In an open letter posted by Quisimbing, clarified that Medreps have professional relationship with doctors. Many other Medreps reposted the said open letter and agreed that their image might be affected. People might think of their job’s negatively. 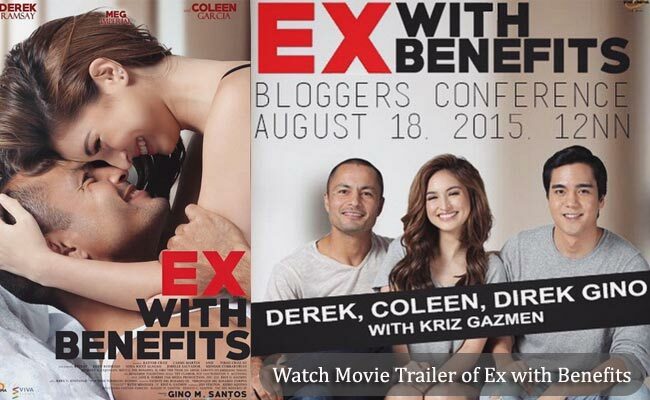 Ex With Benefits will be showing on cinemas starting on September 2,under the direction of Gino Santos.